Lehenga Sarees are a charming blend of the elegance of a saree and sensuousness of a lehenga. This awesome saree innovation is a great way to channel Indian fashion – with ease, grace and stunning style. 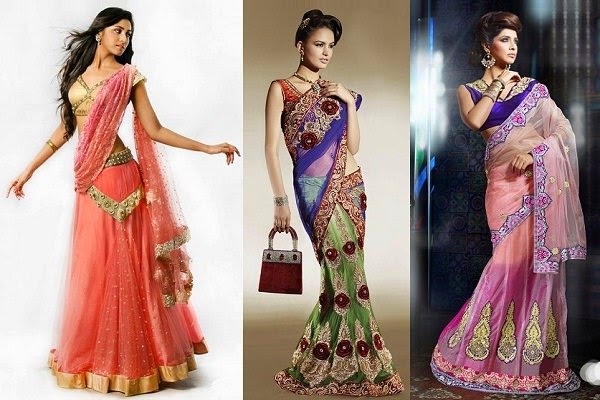 We sincerely feel that lehenga saree is one Indian ethnic trend that you must not miss, this season! Read on to find the perfect lehenga designs for yourself. 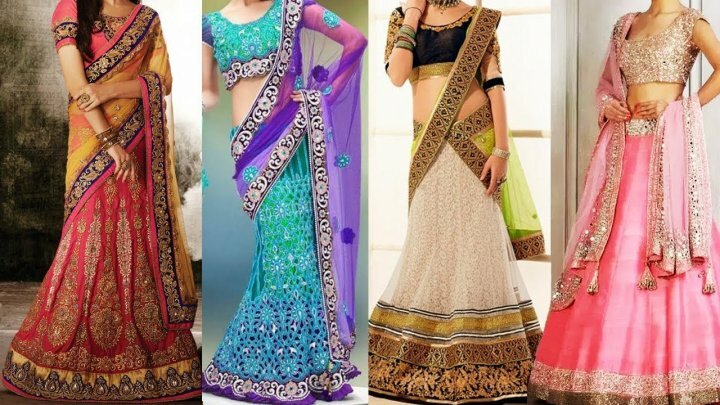 Top 10 Ghagra or Lehenga Saree Picks with Style Tips. Saree, the exquisite six-yard fabric that makes any woman look like a goddess. And the lehenga or Ghagra has been the ethnic staple to, all women out there for years. It has changed in designs and form but has always remained a favourite. But what if two of the remarkable ethnic outfits come together? Well, the result is always better than one. The hybrid baby of a lehenga/Ghagra and a saree gives you the magical Ghagra saree. The looks of a saree and the comfort and ease of a lehenga. The two coming together to bring out the best in both. The trending Ghagra saree is a favourite among one and all. And let us tell you! 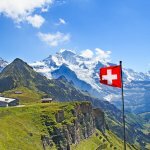 It is here to stay and how. Since it is a blend of two classic ethnics, the Ghagra saree could turn unflattering, if not chosen in the right type or model. There is always a mediocre choice and a great one. We are here to help you find the most attractive, flattering a worthy piece of lehenga saree. 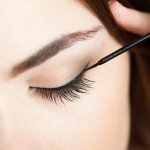 Follow these simple steps, and you will find the perfect set for yourself. Let all eyes be on you, be the showstopper, and nothing less. While making any purchase, make sure the fabric and its quality are top notches. Expensive isn’t a synonym of quality. Pay attention to the touch and feel of the fabric and how it appears on to others. The fabric must look expensive, not be expensive. Even if it is an online purchase, pay attention to the product description that explains, the feel and type of fabric. Each piece could be made of a different fabric. Only make a purchase, if the specifications are top notch and not otherwise. When you opt to make a purchase, especially of a lehenga saree, try to tone down the colours to more basic and classic colours. Unlike the lehenga, it doesn’t come in multiple pieces that can be paired easily with other products, and unlike a saree, the draping style cannot be altered to a great extent. In order to overcome this con, look for classic colours, that can be easily reused and redesigned than jumping on for bright poppy hues. Even in a Ghagra saree, different styles are available. Always go for versatile pieces, for example, those that come with a detachable dupatta, or something that holds the entire piece different from the commonly available Ghagra sarees. Always opt for outfits that are versatile and unique. And make it a point to style them in as many ways as possible to get the most out of an outfit. When it comes to Ghagra Sarees, the pleated portion of the saree or the skirt of the lehenga saree is already stitched to form a skirt like a pattern. This skirt could be made in any model; the normal skirt, the mermaid skirt, the A-line skirt, the ball gown and the list go on. But the key to making the lehenga saree, absolutely flattering, depends on the look and shape of the skirt. The skirt used, must have a flattering silhouette, it is best for pear shaped body type to stay away from mermaid cuts, and any would suit the hourglass. So, choose wisely, as it determines the beauty of both the lehenga and the wearer. Do not follow trends blindly. Go for designs that have and will stand the test of time. The heavy ethics are usually difficult to maintain and are so designed to attract every passing eye. Each outfit worn in ethnic would be remembered, as it is where the real beauty lies. Classic colours, gorgeous embroidery, and good quality will always be in the market as the first priority and shall be yours as well. Choose one such piece that can be passed on to generations as even then to lehenga sarees will be loved and be in trend. Here we bring you the best lehenga or Ghagra saree models with styling tips to find your favourite from among them. These are trending, yet elegant and classy that would make you look fabulous from top to bottom. These classic lehenga sarees are sure to give you a new aspect towards this lovely hybrid and fall in love with ethnic all over again, but this time, not just with style, but also comfort. The chiku and shaded orange embroidered net saree from mirraw.com is your classic style lehenga saree. It has the same skirt like pattern of a lehenga, with a pleated and attached dupatta that would make the whole draping process a cake walk. 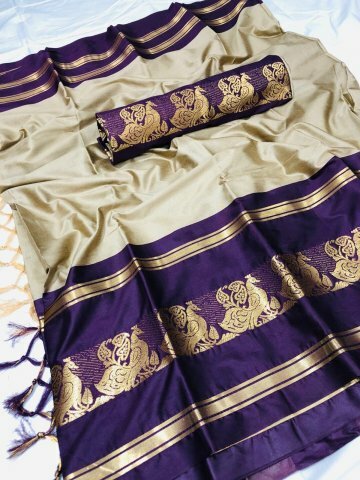 It is simply a unique skirt, dupatta and blouse combo, but the dupatta remains ready stitched with the skirt, giving it a flawless saree finish. The skirt and dupatta are given an ombre shading of milky brown and burnt orange and is paired with a flaming red blouse. All the pieces of the Ghagra sarees are given antique gold patchwork with stones. The combination of red with the not so common brown makes this a unique piece that would attract many glances. The Ghagra sarees made of Net are much more comfortable and freer flowing as compared to others, plus this skirt would give a wavy motion to the skirt, with every step you take. This makes flaunting this saree, nothing short of being on a ramp. This lehenga saree can be styled with orange and brown blouses as well. And if you feel a little adventurous, feel free to drape the saree in a perfect Gujarati style. Since the lehenga saree has heavy embroidered work, make sure to go easy on the neck with jewellery, and focus on earrings and maang tika for bling. This lovely lehenga saree is priced at Rs. 10,276. The Turquoise Blue Lycra Designer Textured Lehenga Saree with Handwork Patch from saree.com is a perfect pick for minimalists. The turquoise blue of the lehenga makes it the perfect pick for Indian cocktail and evening parties. This lehenga saree does have a modern touch to the entire outfit. The fabric used in lycra, which creates a flattering figure to the wearer. The skirt and dupatta are of the same colour and weave pattern with a wavy design. The dupatta is given a unique free-flowing pattern towards the bottom part, giving it a rough, asymmetric finish. The only hand worked design on the entire Ghagra saree, is the black brooch created at the top on the collarbone area, with dangles. The blouse is extremely stylish with an open back and high neck. The black net and heavy embroidery on the blouse compliment the otherwise plain lehenga. This lehenga saree can be paired with white, grey and similar coloured blouses. If needed be, it can also be paired with a white shirt to give an extremely chic indo western look. In this case, the dupatta can be tucked at the hip, giving the shirt a free look. It can be styled with a choker or statement maang tika and clean bun. A stylish haathphool is always the go-to accessory for such looks. This lycra lehenga / Ghagra saree is priced at Rs.11,625. Velvet has always been a go-to fabric for ethnic wear. It imparts a regal and expensive look to the wearer. An outfit becomes all the more expensive when it is made in velvet. And when it comes to Ghagra sarees, how could velvet be kept away. The velvet lehenga sarees are also a great alternative for a bride who is not comfortable wearing a saree or lehenga on her wedding day. It looks as regal as any other outfit, with being comfortable the most key factor to note. The Purple and Peach Velvet Designer Lehenga Saree with Sequins Work by saree.com is a graceful purple velvet lehenga saree and priced at Rs. 10,075. The blouse is heavily embroidered and is given a high neck. The similar pattern is given on the hem of the skirt and borders of the dupatta. The lehenga saree is a unique blend of a purple lehenga, with a peach pallu and heavily designed blouse. The skirt is given golden zari work in large floral pattern. This lehenga is perfect to be worn for weddings, and several other Indian functions. This lehenga saree can be paired with peach, purple, and golden blouses, of any pattern you choose. This lehenga can be paired with a peach off-shoulder top to achieve the perfect indo-western look. Keep the jewellery minimal and carry a statement clutch to give attention to the lehenga and its intricate work. And do not forget a neat hairdo while you are at it. Art silk lehengas have always been a traditional south Indian favourite. The bright colours, feel of the fabric and the regal look makes it one of the most favourite among women. The highlights of art silk lehengas are their traditional designs that have no comparison with another. They are unique and one of a kind. Art silk lehengas also greatly resemble a traditional south Indian saree. 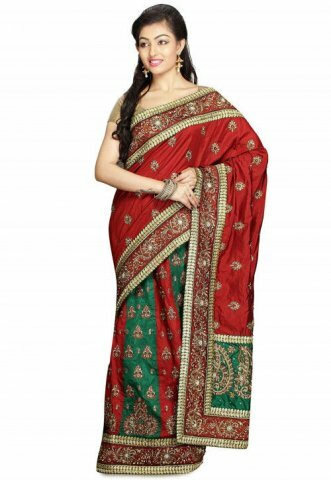 The Embroidered Lehenga Style Art Silk Saree in Red and Green from utsavfashion.in is a unique traditional piece of clothing. 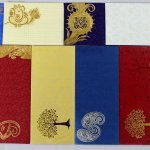 It is heavily designed with zari, resham, cut stones and patchwork border. The skirt has an alternate red and green pattern. This saree is heavily designed and is perfect for wedding functions. Due to the heavy work all over the saree, it is always best if it is worn in one pleat, it gives out a better display of this wonderful piece of clothing. The saree can be worn with red, green, gold and antique colour blouses. Make sure to keep the blouses plain and simple with open neck patterns, to avoid a much-crowded look. Go for heavy Kundan earrings and a statement clutch to complete the look. For a much aesthetic appeal go for a low bun with gajra, or a pin tucked style open hair with gajra in the traditional south Indian style. It is priced at Rs.11,136. Shimmer and shine are inevitable parts of Indian culture and festivities. The more bling is the better. But not everyone enjoys the bling of sequins and stones, and that is where we come to assistance. Go for a crepe shimmery lehenga saree to get the required shimmer, without it being too shiny and in your face. The Embroidered Crepe Shimmer and Net Lehenga Style Saree in Grey from utsavfashion.in is a bling lover’s saviour. The lehenga skirt and blouse is made of black net and is given beautiful patchwork embroidery. The dupatta; attached with the skirt to give it the look of the saree, is made of crepe in shimmery grey. 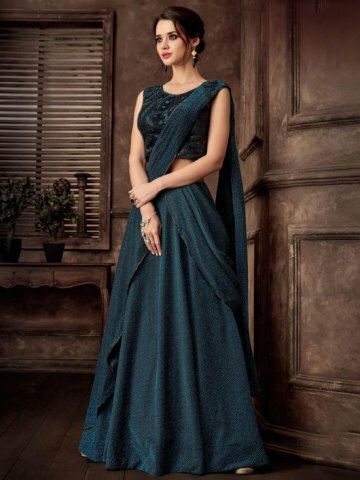 This lehenga saree is perfect for a cocktail functions and evening parties. The patch work on the dupatta is what gives it an exquisite touch. The skirt has a thick border and the similar design is also given on the blouse. This lehenga can be styled with a grey blouse or even antique gold. The lehenga saree can be styled with antique gold jhumka with black bead detailing and a small clutch. This lehenga is best styled when used with a single pleat. Put on your favourite heels and rock the show. It is priced at just Rs.5,648. For the perfect indo western look opt for the soft chiffon lehenga saree. With subtle pastels and muted tones, this beautiful lehenga saree will surely tug your heartstrings. The greatest advantage of this look is that it can be styled up and down as per need. This is the perfect outfit for a beach wedding, and also a full-fledged ceremonial function. The Indus, Printed Fashion Chiffon Saree from flipkart.com is the perfect blend of white and pink. The subtle prints, that shine through on movement and light is worthy to drool over. The lehenga saree has a similar fabric for both skirt and blouse. The blouse has a high-neck and the skirt is A-line. It gives the right amount of fit and flare. The pink dupatta is pleated and placed in the most beautiful fashion to achieve the perfect look. The prints are traditional with a subtle hint of baby pink from the dupatta. The dupatta border has also lied with the same fabric. This lehenga saree can be styled with simple beaded earrings and a pearl finger ring for the simplest wedding look. Keep the hair in loose waves, put on a pair of juttis and you are good to rock a beach wedding. When it comes to the Indian traditional wedding, go for stacked uncut kundan layered necklace with matching studs and maang tika. Put on the most comfortable pair of heels and dance the night away. This gorgeous pastel lehenga is priced at Rs. 1,979. The beauty of embroidery is always unmatched for. The intricate detailing gives any fabric or piece of clothing, beauty and magnetism. When it comes to a lehenga saree, it is always best, if it is a light fabric on which the embroidery is given. This helps the lehenga saree to be more comfortable to wear and also reduce the bulky appearance. 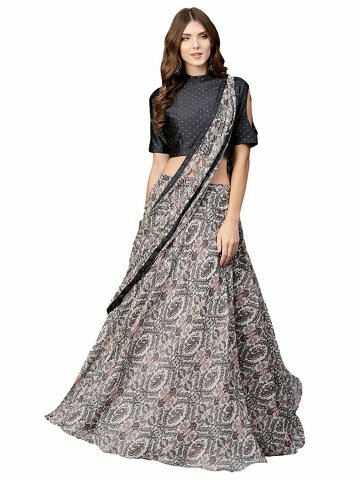 The Chhabra 555, Black Embroidered Partywear Lehenga Saree from myntra.com is a gorgeous black net saree with white and red embroidery all over. The three colours blend in together beautifully to give the most attractive combination. The pallu and blouse of the lehenga saree are pre-stitched and is given heavy red embroidery. This look is the perfect evening party look, no matter what the occasion. Pair this beautiful saree with a red or black blouse of any fashion, and it would turn out beautifully. Go for open hair and dangle earrings for the perfect evening look. For an Indo western look, go for a much relaxed off shoulder top, or a turtle neck for the winters. Rock this look with a black sling bag and high bun. This lehenga saree is priced at Rs. 7,875. The AKS, Mustard Yellow Solid Lehenga Saree from myntra.com is a minimalistic modern design. The ruffled skirt is pleated and stitched together, with a pallu forming out the perfect dupatta. This lehenga saree makes ruffles an easy thing to carry. Being paired with the floral collared blouse gives this plain lehenga saree a much-needed break from the monotony. This saree can be worn with or without pleats. When it comes to styling, this lehenga saree would go perfectly with any contrast blouse or shirt for a western look. Pair it with bold tassel earrings and a messy bun for the perfect brunch or date look. This lehenga saree is a must have in your wardrobe. It would give you a look that can be dressed down or up, as you desire. Wear your favourite stilettos and rock on. This lehenga saree is priced at Rs. 1,649. Georgette is one fabric that cannot be left out if you are talking about sarees and lehengas. No fabric flatters your body like a georgette. For those who are uneasy about the net and see-through fabrics, georgette is the perfect solution. These fabrics are body hugging with the right amount of sheerness to flaunt your curves. 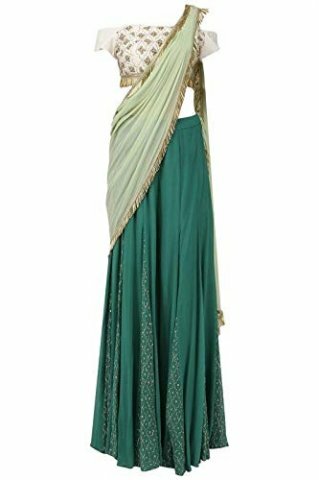 The Jaipuri Fashion Women's Faux Georgette Lehenga Style Patch Work Saree (1114012/llv, Green, Free Size) from amazon.in is a perfect three coloured combo. The dark and mint green complement the off-shoulder blouse beautifully. All pieces are given golden tassel borders and detailing. The blouse has intricate golden work all over the body. 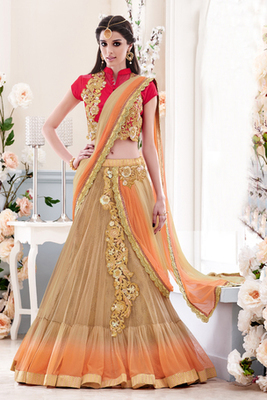 This lehenga would be perfect for a wedding when paired with kundan jewellery and high heels. Dress your hair as desired and adorn them with beautiful pins. Complete this look with a beautiful clutch and stride like a runway model. This beautiful lehenga saree is priced at Rs.2,999 only. Last but not least, the printed fabric. Prints that are too bold get very tiring in case of lehenga sarees. Instead, go with small prints that fall all over the fabric. Make sure the blouse is either plain or with minute detailing. This lehenga saree is also perfect for a casual day. It is the perfect outfit for those who wish to rock Indian every day. The blouse has a high collared neck with cut out patterns on the hands. 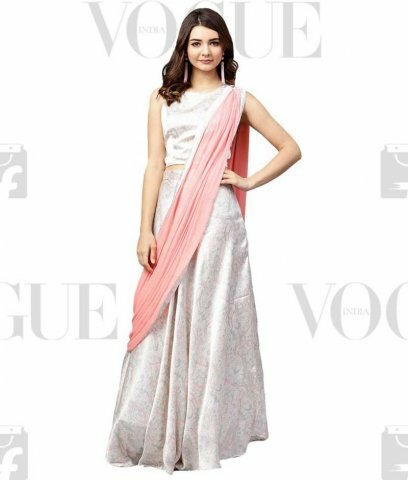 The dupatta is pleated and pinned loosely to the skirt, that has a beautiful flare. For a more put together look the dupatta also has a border from the same piece as the blouse. The lehenga and dupatta is made of chiffon and the blouse of art silk. This is one of the easiest Lehenga Sarees to style. From different styles of blouses to shirts, they go well with everything. From the perfect Indian ethnic to a highly fashionable Indo western look. Keep the jewellery minimal with this casual lehenga saree, leave your hair open and choose flats over heels for comfort. This gorgeous lehenga saree is priced at Rs.2,199. Rock in ethnic with these perfect ethnic lehenga/Ghagra sarees and flaunt your impeccable style quotient. Happy Ethnic shopping people. Lehenga Saree is blended wear of traditional saree and Lehenga. So you will get a traditional look in this year and will be easy to wear than the saree. There is no need for making pleats while wearing Lehenga Saree unlike in normal saree. For this reason, most of the young ladies choose Lehenga Saree as they are less comfortable in wearing traditional saree. Wearing this is very simple like tuck the drape around the body. 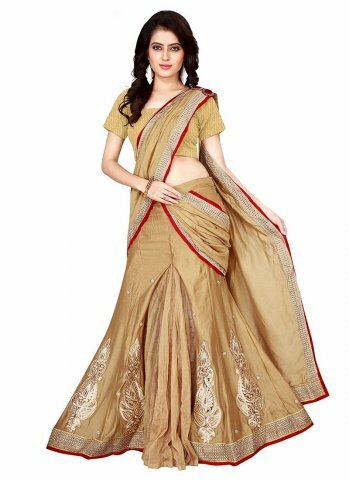 Lehenga Saree is a perfect option for any kind of special occasion as it makes you look beautiful and unique. engagement collection etc. Usually, Lehenga saree with heavy work is chosen for wedding functions. Lehenga Sarees are available in different fabrics. You can choose the right one that gives you more comfort. Wear suitable ornaments to see you more charming.